All natural dog seizure remedy. Categories: Repeat Delivery, Seizures & Epilepsy. SeizureGuard rebalances and increases your dog’s immune, neurological, kidney, circulatory, and defensive systems up to optimal performance. As a result your dog will be less likely to experience a seizure, and when a seizure does occur, chances are good that it will last shorter and cause less damage. And perhaps the most critical benefit of SeizureGuard is that, when a seizure does occur, your dog will be able to recover quickly from it. It is in this phase where most permanent damage and life threatening effects occur – when a dog cannot recovery from an epileptic attack. Designed byveterinarians to be used in conjunction with prescribed medication. Overall body stiffness, circling around, agatated, excessive salivating, loss of consciousness, muscle twitching, tremors, leg shaking, uncontrolled urinating, un expected bowl movement. There is no cure for dog seizures. Never discontinue medication prescribed by your veterinarian, or replace a prescribed medication with Seizureguard. Seizureguard is a supplement to any medication prescribed by your veterinarian to build up vital systems in the event of an epileptic attack. Sprinkle 2 scoops (approximately 1,250 mgs) per each 1 cup of food (scoop is provided with SkinPlex) for dogs weighing 2 to 175 pounds. 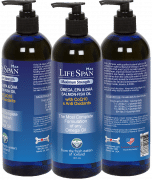 As the only fish oil for dogs with CoQ10, LifeSpan CoQ10 will greatly improve overall health to include your dog’s immune system, heart, and circulation. It also helps boost recovery from age and pain. It’s all in a day’s work for CoQ10! Successfully used by Thousands of Satisfied Pet Owners & Professionals – Guaranteed Results! all natural wild salmon oil with coenzyme q10 & antioxidants. 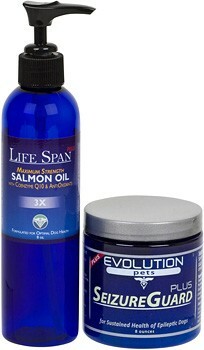 Fish oil for dogs is one of the best all around daily supplement the can be given to our pets! It is rich in Omega Oils which are needed to promote optimal health in dogs. Veterinarians and animal professionals agree that a vast majority of health related issues in dogs are a result from lack of nutrients and supplements in their diet. Available in 8 ounce and gallon sizes. Protease: Protease acts as a catalyst to repair damaged proteins, reduces blood toxins after a canine epileptic attack, rebalances the immune system by modulating protein levels, supports increased blood flow essential after an attack resulting from epilepsy, and speeds tissue and muscle repair. Amylase: Amylase is one of the best defensives against many diseases including epilepsy in dogs. After an attack, Amylase successfully works in muscle building and improving immune system in order to burn the calories and fight against those chronic diseases. Lastly it has great calming benefits that will help your dog to stop shaking. Chia Powder: Chia is a natural food source for added energy and endurance. High in omega-3 fatty acids Chia will help your dogs circulatory system and heart maintain peak levels needed in epileptic dogs. It also benefits a dog’s joints after an attack, as well as supporting a healthy neurological and brain functions. It has a very high protective antioxidant value and is rich in vitamins, fiber and protein. Cellulase: Cellulase is particularly helpful because the body is unable to produce it. It promotes healthy liver functions, and helps muscles and tissue to repair themselves quickly after an attack. Hemicellulase: Hemicellulase does a outstanding job at helping cells establish and maintain optimal sustainability levels. Hemicellulase also plays a vital role in cell tissue repair so vital after an attack. As it has such strong benefits to cell layers, it also helps dog’s joints and muscles maintain pain free movement and flexibility. Lipase: works in conjunction with protease and amylase to promote a healthy liver and immune system. Normal digestion of dietary fat is accomplished by lipases with the assistance of bile, which is produced by the liver and normally supplied by way of the gallbladder. Incomplete digestion of these fats may cause a fatty acid deficiency which greatly weakens membrane structure in cells throughout the body. Without a daily supply of Lipase a dog prone to seizures may not be able to recover form even mild attacks properly. Papin: Papin enzymes are used to reduce swelling and fever after an attack. These enzymes are useful as an anti-inflammatory and can also help to alleviate edemas and epilepsy in dogs. Papain also helps to regulate the bowels and helps to clean away dead tissues from the body which is needed to support optimal liver and immune system health. Papin enzymes may also prove beneficial to pets who suffer from hip and joint pain. It can also help boost immune system function. Milk Thistle: Milk Thistle is a suggested nutrient to administrator after a seizure, as well as to help prevent after effects. It also is good at controlling muscle tremors and shaking. It helps the liver repair itself not only quicker, but more completely. In fact, Milk Thistle is gaining great popularity as a supplement for humans defending against seizures and cancer. Belladonna: Belladonna has been shown to help to control and decrease muscle spasms, tightness of limbs, and uncontrolled muscle jerking. Peony: Peony has been used for thousands of years for its pain relieving and tranquilizing effect on a dogs nerves. 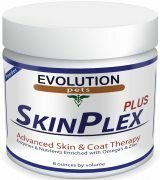 It also supports muscle cell repair, and relieves muscle pain after an epileptic attack. ,It also has a purifying effect on the blood. Bromelan. Bromelan has been shown to provide wonderful immune building properties. It also helps blood cells delivery needed oxygen to damaged areas of the body after dog seizures. Tang-Kuei: Tang-Kuei has been shown to help speed up the recovery of defensive systems as well as help keep the liver at peak performance to guard against dogs seizures. Zinc Gluconate: Zinc is an essential mineral that is found in every cell in a dogs body. It stimulates activity in over a hundred enzymes and substances in a dogs body. Its best benefit is that it helps maintain a healthy immune system and is needed for wound healing. Zinc is also needed for DNA synthesis. Maltodextrin: Maltodextrin is a polysaccharide that contains many glucose molecules linked together. During and after a seizure a canine needs to distribute glucose very quickly to damaged areas of the body including muscles and vital organs. Maltodextrin allows glucose to enter the blood stream much more quickly to distribute throughout the body. For dogs with epilepsy this is particularly beneficial to repair damaged muscle and kidney tissue associated with seizures in dogs. Beta-galactosidase: beta-galactosidase has been shown in studies to reduce the frequency and severity of seizures. It also supports optimal immune and liver health.